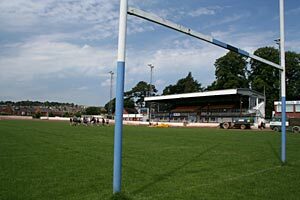 The end of the rugby season in 2006 will not only see another sporting year pass, but it will see the end of the County Ground in St Thomas for ever. It is to be torn down by Bellway Homes and replaced by 150 houses. Higher Church Field or the Cricket Field in St Thomas, a parcel of land off Cowick Street, behind the church had been used as a cricket, and football ground, and also for wrestling matches in the 19th century. Wrestling was popular between the hay and corn harvests, probably because of a large, itinerant audience. In July 1841 an acre and a quarter of circular land was formed to create a wrestling ring with raised seating covered with tarpaulins. The prize was a 100 sovereigns, a great deal of money then. In 1888, the owner put the field up for sale for either houses or a recreation ground. The Devon County Athletic Company Ltd was formed in 1893 for athletic and recreational purposes. The Company included Robert Pople the proprietor of the New London Inn and three times Mayor, P C M Veitch, the nurseryman and John Stocker the builder and councillor. The company built a grandstand to seat 700, along with an elliptical cycling track. At first the ground was used by the Exeter Cathedral School for cricket, rugby and tennis and for the Exeter Football Club, which actually played rugby. Later on, the County Ground also hosted the local Civil Service and Exe Vale Cricket Clubs. There were cycling events, a popular past time then, and even an annual horse show, all of which must have made the groundsman's job very difficult. The 1901 Coronation Programme for the County Ground advertised a day of sports events including an egg and spoon race, sack race, old man's race and the greasy pole. Oh, and no spurs were to be used on the donkeys! The next day there was a Military Tournament which included a cycle race for men who have never won a prize and the Victoria Cross Competition. On day three and four was the Devon and Exeter Horse Show Society's Exhibition. 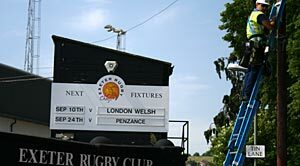 The first match that the New Zealand All Black's ever played in England was at the County Ground, against the Devon County rugby side. The match was played on 16 September 1905, with the final score 55 to 4, in the All Blacks favour. Bill Wallace, a New Zealand player wrote in his diary that the win was “as great a sensation in England as I believe it was in New Zealand.” Strangely, because Devon County had forgotten their kit, they played in the Exeter rugby club colours of white jersey with a black hoop across the chest. The County Ground was the venue for a pageant to celebrate the Coronation of King George V and Queen Mary in 1911. Altogether, three thousand children took part in the Empire Pageant along with the Fourth Battalion Devon Regiment and Exonia Military Band. Three schools put on a display of marching, one wearing red jerseys, one white and children from the St John's Hospital School in blue. It rained for the first part of the event, soaking the children and bands. In the evening there was a Grand Firework Display to round off the proceedings. The First World War saw the County Ground closed for the duration, but when hostilities had ended a new grandstand was built in 1921 to replace the old grandstand that had been burnt down in 1918. There had been laid around the pitch an asphalt cycle track and, in late January 1929, it was ripped up and cinders laid for a new Australian attraction called speedway. The first meet was in March 1929, and for the next two years, speedway was a regular event, only to close in 1931. There was an attempt in the mid 1930's to introduce car racing, and a couple of meets were arranged, but it never caught on. More successfully, greyhound racing was introduced at the stadium, to become a regular event. The Second World War saw the ground taken over by the military, mostly for army transport, and the American forces preparing for D-Day also used the space for stores and transport. It wasn't until 1947 that speedway returned to the County Ground. In 1960 Speedway Enterprises signed a lease to start racing in July the same year. From that time, the Falcons were a regular feature on Wednesday evenings at the County Ground. October 2005, saw Ivan Mauger ride the last four laps around the County Ground, the last speedway rider to do so - the Exeter Falcons have not found a new home at the time of writing. 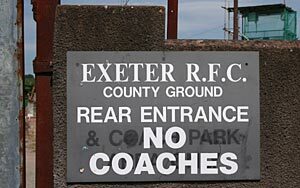 The ground remained the home for Exeter's rugby team and in October 1979, the South African rugby team visited for a match on their national tour - it was not a popular tour, due to apartheid in their country. The County Ground was picketed by several hundred protestors, many of them students, objecting to their presence on the day of the game. The capacity of the County Ground is 5,200 with 750 seated in the grandstand. The redevelopment has given the Exeter Chiefs the chance to build a new stadium at Sandy Park near Sowton with an increased maximum capacity of 8,200, and which will allow the Chiefs premiership status. 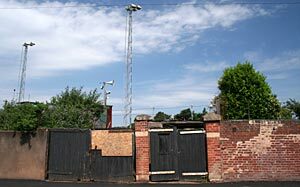 And the County Ground will fade into history, to be remembered through memories and yellowing photographs. Source - An Exeter Boyhood by Frank Retter, the Express and Echo and AllBlacks.com, the 1901 Coronation Programme. © 2006 David Cornforth - not to be used without permission. The main stand at the County Ground. 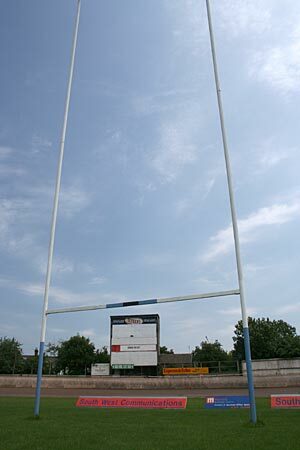 The score board through the posts. The faded and broken boundary of the ground. The next match board. 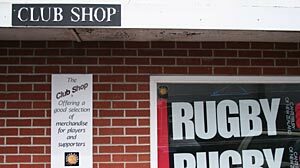 The Chiefs' Club Shop. A faded sign at the rear of the ground.